Decorated Christmas trees with traditional holiday ornaments and color schemes, are central to a Country Christmas. Whether your decorations are homemade or store-bought, you can adorn your home with rustic treasures that your family will enjoy, year after year. 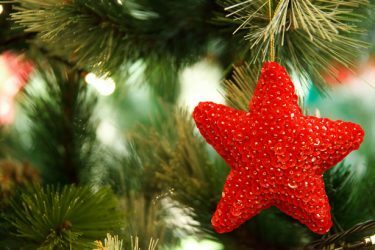 Although your family’s tree does not have to be picture-perfect, there are a few tricks to making it all work, keeping in mind that your home and your Christmas tree should reflect you and your family. 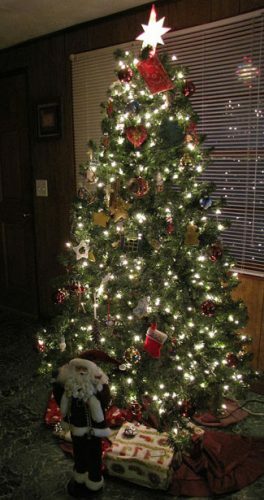 White lights are popular on log home decorated Christmas trees. White lights, or no lights on your tree, are traditional for Christmas holiday décor in log cabins and post and beam homes. Using neutral colored lights gives you the option of using any color scheme that you’d like, without having your tree become gaudy or commercial looking. And, in addition, if you like a little variety and want to vary your Christmas tree theme from year to year, you can do so without changing the lights. Even if you have a modern timber frame home or a modern structural insulated home, white lighting allows you to use a more modern approach with vivid colors and modern Christmas tree ornaments. 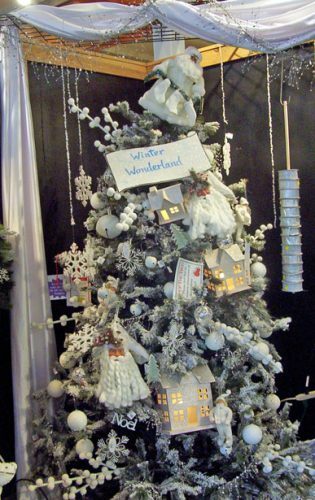 Decorated Christmas trees, with all white ornaments, reflect the color of snow, traditional at Christmas. Simple color schemes convey a casual atmosphere. And, if you use colors from Nature—muted colors, earth tones or natural tones, you bring the outdoors into your log or timber home. 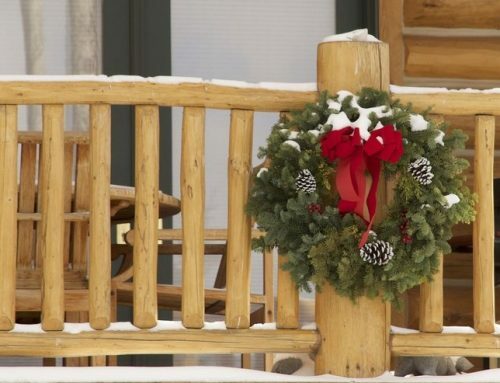 The warmth of wood and the natural color tones are complementary and enhance your holiday décor. Blue is a traditional Christmas color, often associated with Mary, the virgin mother of Christ. Red is also traditional, used with Santa and his many helpers. The tree above is a bit ornate and may not appeal to your taste, but the simplicity of the color scheme would work well in a natural setting. Bows and candy canes often adorn decorated Christmas trees. 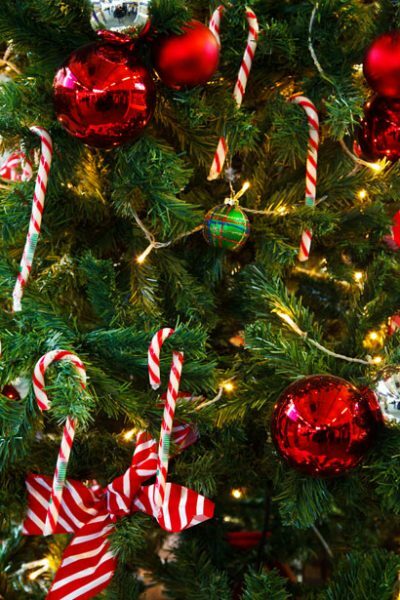 Traditional red bows and candy canes are often found on country Christmas trees. For a very simple (but classy) approach, you can just use large red bows and small white lights–and you’re done! It’s easy, and it’s beautiful! If you prefer a more rustic look or an antique look, keep your red tones darker or more muted. Bows, used on a Christmas tree can be the only decorations, they can be used alone with white lights, or they can be used as part of a tree that is decorated with many different ornaments. Homemade Christmas cookies make great ornaments for trees. Making homemade Christmas treats is traditional, world-wide. And many countries use Christmas cookies as ornaments for their decorated Christmas trees. Gingerbread cookies are a favorite, but other cut-out cookies work well, too. When you make your cookies, make sure you make a small hole near the top (before you bake them), so that you can insert a string for hanging later, without breaking your cookies. 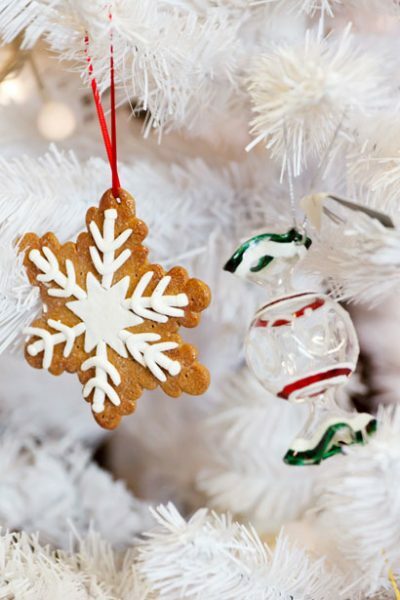 Making cookie ornaments is a fun activity for you and your children or grandchildren to do together. Tree ornaments can be handmade and passed down from generation to generation. These ornaments will become keepsakes. Homemade ornaments are popular on decorated Christmas trees in the country. This sequined star ornament is similar to some that my grandmother made for our tree, almost 50 years ago. I still have a few of those ornaments that she made years ago as gifts for our family. One special ornament was a bird’s nest with a small artificial bird in it. Placing the nest on your tree each year is supposed to bring you good fortune for the coming year. 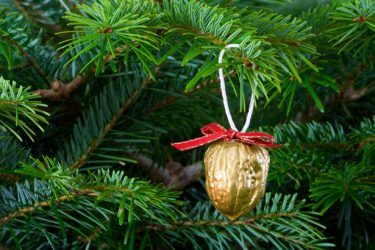 Simple items from nature, like this walnut, can be used on decorated Christmas trees. Items from Nature are often more beautiful than tree ornaments that you can purchase, and they will cost you nothing. This walnut ornament above is an example, but you could also use pine cones, holly, acorns, dried flowers and weeds or even fruit like apples and oranges. Decorated Christmas trees will always be a part of a traditional Christmas. They don’t have to be fancy or expensive, and some of the most beautiful ones are decorated simply, with natural objects found outside your home.